The Order of Saint Stephen (Hungarian: Szent István rend) was an order of knighthood founded by Maria Theresa in 1764. 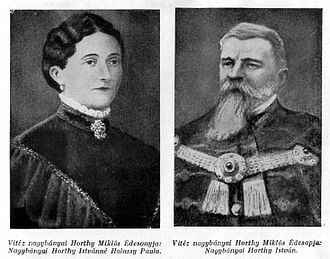 In 1938, Miklós Horthy took the rights and activities of Grand Master as Regent of Hungary. The name of the Order changed to The Royal Hungarian Order of Saint Stephen (German: Königlich Ungarischer Sankt-Stephans-Orden, Latin: Ordo Equitum Sancti Stephani Regis (Hungariae) Apostolici). The Order was terminated at the time of the proclamation of the Republic of Hungary in 1946. It was recreated in 2011 as the Hungarian Order of Saint Stephen, and to this day remains the highest order in Hungary. The order is named after Hungary's most famous king, Stephen I, whose reign (997 – 1038) was marked by his consolidation of the monarchy, the establishment of the medieval state of Hungary, and his adoption of Christianity as the state religion. 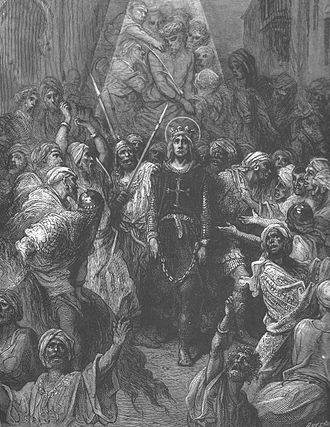 His coronation, as recognized in the Church, is dated 1001. He died August 15, 1038, during the Feast of the Assumption. His feast day in Hungary is August 20. Canonized by Pope Gregory VII in 1083 along with his son Imre (who preceded him in death in 1031, after a hunting accident) and Bishop Gerhard of Hungary, St. Stephen is the patron saint of "Hungary, kings, the death of children, masons, stonecutters, and bricklayers." 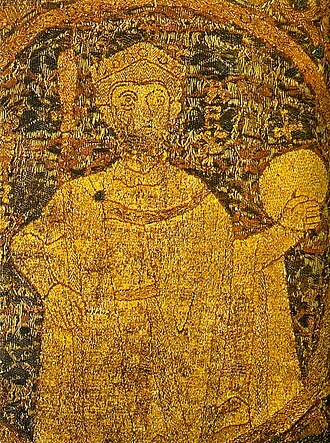 Though its exact provenance is somewhat disputed, the Crown of St. Stephen is said to have been a gift from Pope Silvester II, upon Stephen's 1001 coronation. one had to have at least four quarterings of arms showing as many generations of noble status. It helped promote her (Maria Teresa's) position as Queen of Hungary and reinforced the quasi independent position of Hungary in the Empire. The original statutes allow for only 20 Grand Crosses, 30 Commanders and 50 Knights who are to be "distinguished for virtue and merit and noble birth". Grand Cross Knights were considered so important that the Emperor was to address them as "Cousin". 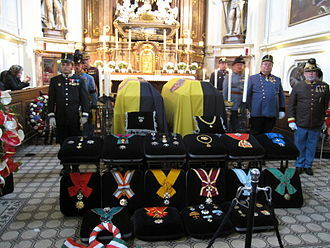 These insignia were to be returned to the Chancellery of the Order on the death of the holder. There was no military application of this order. It is rare, and even modern awards of St. Stephen are seldom seen. Perhaps more than any other Austrian order, this one approached the ideal character as put forth in its statutes and regulations. Grand Cross – For ceremonial purposes, a full set of robes were prescribed, following the tradition of other orders, such as the Austrian and Spanish Orders of the Golden Fleece and Great Britain's Order of the Garter. The robes were crimson and green, and were lined with ermine. A collar of gold was worn about the neck and shoulders, with the badge of the Order suspended from the collar. For normal occasions and every-day wear, a sash of crimson, edged with green, was worn over the right shoulder and extended to the left hip, the distinctive badge of the Order suspended from the sash at the hip. An eight-pointed star was worn on the left breast. During the waning days of the monarchy, especially during the Great War, a less formal option was also authorized, whereby a miniature (a so-called “kleine Decoration”) of the breast star was affixed to the center of the ribbon of an ordinary knight's cross, and was worn on the left breast with other orders and military medals, in order of precedence. Knights Commander – wore the badge of the Order at the throat, suspended from the crimson edged with green ribbon about the neck. During the Great War, the informal wear of the miniature, gold, Crown of Saint Stephen kleine Decoration was worn on an ordinary knight's cross, to delineate them from ordinary knights and Grand Cross knights, and worn on the left breast with other orders and military medals, in order of precedence. Knights – wore the badge of the Order, suspended from a tri-fold ribbon of crimson, edged in green, on the left breast with other orders and military medals, in order of precedence. The following is a partial list of knights of the Royal Hungarian Order of Saint Stephen, as compiled from a variety of sources listed in the bibliography. A nearly complete list, MAGYAR KIRÁLYI SZENT ISTVÁN REND, is available in the Hungarian language, online. 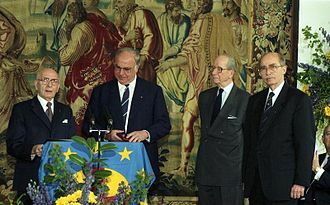 Otto von Habsburg (20 November 1912–4 July 2011); stepped down from his role as head of the House of Habsburg in January 2007, in favor of his son Karl. Samuel von Brukenthal (1721 – 1803), Governor of Transylvania, personal advisor of Empress Maria Teresa. Field Marshal Karl Phillip Fürst zu Schwarzenberg (April 18, 1771 – October 15, 1820), Field Marshal of Austria and Commander in Chief of the Grand Army of Bohemia during the Napoleonic Wars. Géza Baron Fejérváry de Komlós-Keresztes (1833 – 1914), Hungarian general officer and Prime Minister of Hungary, 1903 – 1907; invested as Knight, 1875, Knight Commander, 1882, and Grand Cross, 1901. 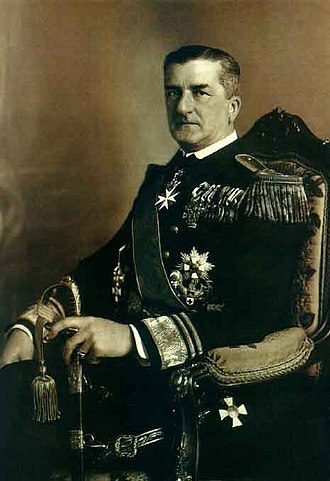 Vice Admiral Miklós Horthy von Nagybánya (18 June 1868 – 9 February 1957), Vice Admiral of the Austro-Hungarian (K.u.K.) Navy, Commander-in-Chief of the Imperial Fleet, and Regent of Hungary. Knight Commander of the Royal Hungarian Order of Saint Stephen. The lesser decoration worn on a Knight's Cross was authorized during the Great War for those who preferred it to wearing it suspended at the neck. Miklós (Nicholas) grof Vay (1802 – 1894), member of the Hungarian Privy Council and the Hungarian Parliament; invested as Knight Commander, 1846. Feldzeugmeister Franz graf Gyulay (1798 – 1868), Austrian Minister of War; invested as Knight Commander, 1848. Cardinal János Scitovszky (1785 – 1866), Bishop of Rozsnyó and Pécs; Cardinal 1853; invested as Knight Commander, 1849. Ferenc (Francis) grof Zichy (1811 – 1900), Secretary of State for Commerce, Széchenyi ministry of 1848, and later Austro-Hungarian Ambassador to Constantinople; invested as Knight Commander, 1849. Batthyány Imre (1781 – 1874), Jurist and Lord Lieutenant of Latvia; invested as Knight Commander, 1861. Stephen Melczer (1810 – 1896), member of the Hungarian Privy Council and House of the Lords; invested as Knight Commander, 1867. Baron Levin Rauch de Nyék (1819 - 1890), viceroy of Croatia-Slavonia, and of Kingdom of Croatia-Slavonia for four years (1867-1871); invested as knight Commander, 1869. Joseph Szlávy (1818 - 1900), Hungarian Prime Minister and later president of the Hungarian House of the Lords; invested as knight Commander, 1869. Baron Béla Orczy, Minister of Defense and Minister of the Interior; invested as Knight Commander, 1873. Feldzeugmeister Franz von Uchatius (1811 – 1881), ordnance expert and master artillerist, and member of the Viennese Academy of Sciences; invested as Knight Commander, 1875. Károly Csemegi (1826 – 1899), Hungarian judge and jurist; instrumental in the creation of the first criminal code in Hungary (1878); first Presiding Judge in the Hungarian Supreme Court; invested as Knight Commander, 1878. Sándor Matlekovits (1842 – 1925), Hungarian economist and author of several treatises on trade policy within the Austro-Hungarian Empire; invested as Knight Commander, 1885. Beniczky Ferenc, Hungarian aristocrat and Intendant of the Budapest Academy of Music and the Budapest Opera, from 1888; invested as Knight Commander, 1890. Daruváry Alajos (1826 – 1912), politician, member of both houses of the Hungarian Parliament, vice president 1898 – 1900; invested as Knight Commander, 1892. Generaloberst Artur frhr von Bolfras (1838 – 1922), chairman of the Military Chancery and general adjutant to Franz Josef I, 1889 – 1917; invested as Knight Commander, 1892. Dr. Heinrich Wittek (1844 – 1930), Austrian politician: Director General of the Ministry of Commerce, 1886 – 1897, Minister of Railways, 1897 – 1905; invested as Knight Commander, 1893. Semsey Andor (1833 – 1923), Hungarian naturalist and geologist; eventual member of the Hungarian Parliament; invested as Knight Commander, 1896. Dr. Miksa Falk, tutored Emperor Franz Josef I in the Hungarian language, and ancestor of actor Peter Falk; invested as Knight Commander, 1898. Feldzeugmeister Oskar Potiorek (1853 - 1931), III Corps commander, 1897; eventual IG of the K.u.K. (1911 - 1913), Military Governor of Bosnia-Herzegovina (1912 - 1914), and 6th Army Commander (1914) ; invested as Knight Commander, 1906. Baron Guenther Heinrich von Berg (1765 – 1843) German Statesman, awarded June 9, 1820. 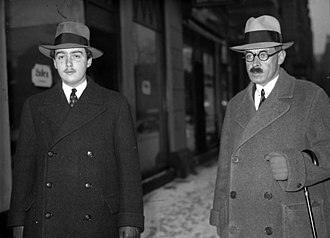 After the dissolution of Austria-Hungary, Hungary and Austria could not make a legal agreement on the rights of the Order. The base of the argument was if Maria Theresa founded the Order de jure as the sovereign of Hungary, or the sovereign of Austria or as a Holy Roman Empress. 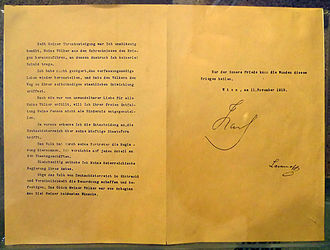 In 1938, when Austria as a de jure successor state of Austria-Hungary ceased to exist as became part of Germany, Horthy issued an addendum to be attached on 4 November 1938 to the statutes of the Order which declared as long as the leadership rights of the kingdom is held by the Regent, also the Grand Master rights and activities of the Order is practised by it. János Áder (born 9 May 1959), President of Hungary. According to the Constitution of Hungary's CCII/2011 law as the President of Hungary receives automatically the Grand Cross of the Order of Saint Stephen. Krisztina Egerszegi (born 16 August 1974) is a Hungarian former world record holding swimmer and one of the greatest Hungarian Olympic champions of the modern era. She is a three-time Olympian (1988, 1992 and 1996) and five time Olympic champion. Invested in 2013. Alexandre Lamfalussy (26 April 1929 – 9 May 2015) was a Hungarian-born Belgian economist and central banker. Invested in 2013. Imre Kertész (9 November 1929 - 31 March 2016) is a Hungarian author, Holocaust concentration camp survivor, and recipient of the 2002 Nobel Prize in Literature. Invested in 2014. Ernő Rubik (born 13 July 1944) is a Hungarian inventor, architect and professor of architecture. He is best known for the invention of mechanical puzzles including Rubik's Cube (1974), Rubik's Magic, Rubik's Magic: Master Edition, and Rubik's Snake. Invested in 2014. Judit Polgár (born 23 July 1976) is a Hungarian chess grandmaster. She is generally considered the strongest female chess player in history. Invested in 2015. Peter Eötvös (born 2 January 1944) is a Hungarian composer and conductor. Invested in 2015. Éva Marton (born June 18, 1943) is a Hungarian dramatic soprano, particularly known for her operatic portrayals of Puccini's Turandot and Tosca, and Wagnerian roles. Invested in 2016. Ádám Makkai (born December 16, 1935) holder twice of the Kossuth Prize, Hungarian poet, linguist, translator, retired professor emeritus of the University of Illinois. Invested in 2016. Paul Demeny (born December 24, 1932) Hungarian Demographer. He invented the concept of the Demeny voting system. Invested in 2018. ^ "Kitüntetések". www.keh.hu. Retrieved 21 August 2018. ^ "Kiállítás nyílt a Szent István-rend világáról a Magyar Nemzeti Múzeumban". Retrieved 21 August 2018. ^ a b c Lajos, Csordás (8 May 2014). "A zöld szárú kereszt lovagjai". Retrieved 21 August 2018. ^ "20th August". augusztus20.kormany.hu. Retrieved 21 August 2018. ^ "Message to the Hungarian Nation on the first Millennium of St Stephen's coronation (August 21, 2000) - John Paul II". www.vatican.va. Retrieved 21 August 2018. ^ "Stephen I - king of Hungary". Retrieved 21 August 2018. ^ Kelly's Handbook to the Titled, Landed and Official Classes, 1918. Kelly's. p. 1250. In view of the fact Austria-Hungary were at war with Britain from August 1914 it is highly likely his award was made before that month. He had entertained Archduke Franz Ferdinand at his English estate in 1913. 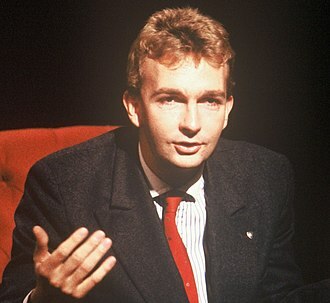 ^ Most likely to have been invested prior to fleeing Albania in 1939, and hence living in Western exile. ^ Sauer, Arthur (1889). Almanak Administrativo, Mercantil e Industrial (in Portuguese). Rio de Janeiro: Laemmert & C.
^ "Szent István Renddel tüntették ki Kertész Imrét és Rubik Ernőt". Kormányzat. Retrieved 21 August 2018. ^ "Hungary honours Nobel laureate, Rubik's cube inventor". Retrieved 21 August 2018. ^ Zrt., HVG Kiadó (20 August 2015). "Polgár Judit és Eötvös Péter kapta a Magyar Szent István-rendet". Retrieved 21 August 2018. ^ a b "Az augusztus 20-i állami kitüntetettek és díjazottak névsora - Magyar Idők". Retrieved 21 August 2018. ^ a b Kft., New Wave Media Group. "Erdő Péter és Vásáry Tamás vehette át a Szent István Rend díjat". Retrieved 21 August 2018. Beatty-Kingston, William (1888). Monarchs I Have Met. New York: Harper and Brothers. Weatherly, Cecil (1911). "Knighthood and Chivalry" . In Chisholm, Hugh. Encyclopædia Britannica. 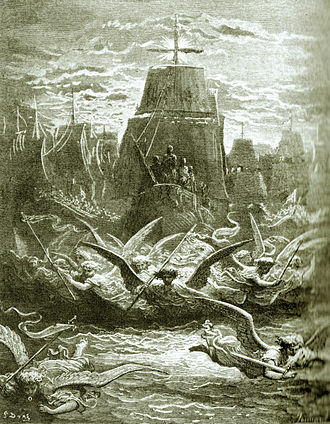 15 (11th ed.). Cambridge University Press. p. 862. Gudoy, José Francisco (1910). Porfirio Diaz, President of Mexico, Master Builder of a Great Commonwealth. New York: Putnam. Habsburg, (Archduke) Dr. Otto. "Primary source / personal website of the Archduke". Herold, Stephen. "Austrian Orders, Decorations, and Medals of the Napoleonic Period". antiquesatoz.com. "Les Hussards au travers des photographies anciennes". Royal Hussard. 2007. "Index of Royal Colonels of Commonwealth Land Forces". regiments.org. Jewison, Glenn; Steiner, Jörg C. (2007a). "Austro-Hungarian Army - Biographies". austro-hungarian-army.co.uk. Jewison, Glenn; Steiner, Jörg C. (2007b). "Field Marshals of the Austro-Hungarian Army, 1914 – 1918". austro-hungarian-army.co.uk. "Magyar Királyi Szebt István Rend (A complete list of knights, by year, in Hungarian)". tornai.com. Archived from the original on 22 December 2010. Mösslang, Markus; Frietlag, Sabine; Wende, Peter, eds. (2003). British Envoys to Germany, 1816 – 1866. 2 (1830 – 1847). Cambridge University Press. Payne, Horne (1862). 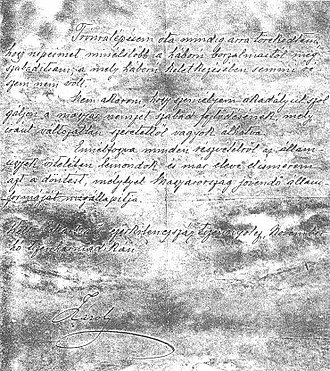 The Address of the Hungarian Diet of 1861. London: Bell and Daldy. Schmidt-Brentano, Antonio (2007). Die k.k. bzw. K.u.K. Generalität, 1816 - 1918 (PDF). Vienna: Austrian State Archives. He was the last fully functioning Elector of Cologne and was the employer and patron of the young Ludwig van Beethoven. Maximilian Francis was born in the Hofburg Palace, Vienna, in 1780, he succeeded his uncle Prince Charles Alexander of Lorraine as Hochmeister of the Deutscher Orden. 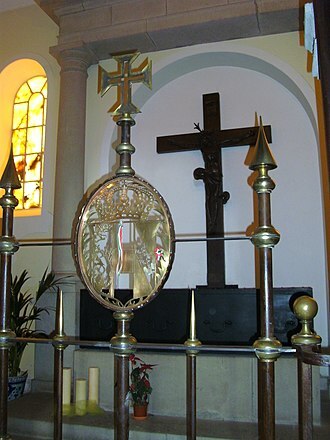 In 1784, he became Archbishop and Elector of Cologne, living in the Electoral residence at Bonn and he remained in that office until his death in exile. In his capacity as chancellor of the Holy Roman Empire for Italy and as the Popes deputy he crowned as Emperor in Frankfurt first his brother Leopold II in 1790, the court organist, Christian Gottlob Neefe, was Beethovens early mentor and teacher. Recognising his young pupils gift both as a performer and as a composer, Neefe brought Beethoven to the court, advising Maximilian Francis to appoint him as assistant organist, Maximilian Francis, recognised the extraordinary abilities of the young Beethoven. In 1792, shortly after Mozarts death, Maximilian again sent Beethoven on full salary to Vienna to study under Joseph Haydn, Antonio Salieri, the Elector maintained an interest in the young Beethovens progress, and several reports from Haydn to Maximilian detailing it are extant. Wenzel Anton, Prince von Kaunitz-Rietberg was an Austrian diplomat and statesman of the Habsburg Monarchy. 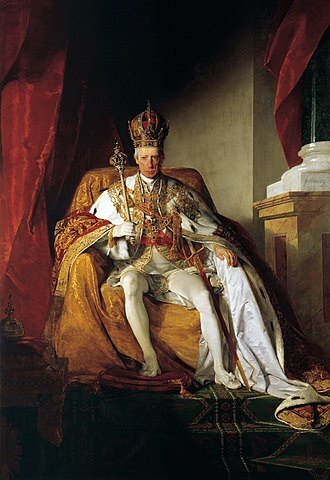 A proponent of enlightened absolutism, he held the office of State Chancellor for about four decades, responsible for the policies under the reign of Maria Theresa, Joseph II. In 1764 he was elevated to the rank of a Prince of the Holy Roman Empire. The Kaunitz family belonged to the old Bohemian nobility and, like the related Martinic dynasty, first mentioned in the 14th century, they first lived in the Silesian duchy of Troppau, in 1509 they moved to Slavkov Castle near Brno. Wenzel Antons grandfather Dominik Andreas von Kaunitz served as a Habsburg Geheimrat, wenzels father Count Maximilian Ulrich was appointed member of the Aulic Council in 1706, he served as Imperial envoy and as governor of Moravia from 1720. By his marriage with Marie Ernestine in 1699, he inherited the immediate County of Rietberg in Westphalia, Wenzel Anton himself married Maria Ernestine von Starhemberg, a granddaughter of Imperial Chamber president Gundaker Thomas Starhemberg, on 6 May 1736. 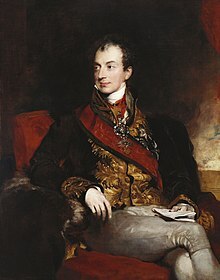 Four sons were born of the marriage, among them the Austrian general Count Franz Wenzel von Kaunitz-Rietberg, Wenzel Antons granddaughter Eleonora married his successor in the office of the State Chancellor, Prince Klemens von Metternich. As the second son, it was at first intended that Wenzel Anton should become a clergyman, with the death of his elder brother, however, he decided on a secular career, and studied law and diplomacy at the universities of Vienna and Leiden. He became a chamberlain of the Habsburg emperor Charles VI, and continued his education for years by a Grand Tour to Berlin, the Netherlands, Paris. Back in Vienna, he was appointed member of the Imperial Aulic Council in 1735, at the Imperial Diet of Regensburg in 1739, he was one of the emperors commissaries. During the War of the Austrian Succession, in March 1741, he was sent on a mission to Florence, Rome. In August 1742 he was appointed ambassador at Turin and reached the support of King Charles Emmanuel III for Maria Theresa, upon the December 1744 death of Charles consort, Archduchess Maria-Anna, a sister of Maria Theresa, Kaunitz was virtually the head of government. Archduke Alexander Leopold was born in Florence, Tuscany, as the sixth child and fourth son of Leopold I, Grand Duke of Tuscany, and Infanta Maria Luisa of Spain. During his education, Alexander Leopold excelled in mathematics and chemistry and he had a fine physique and his father thus wanted him to pursue a military career, with the intent to eventually appoint him president of the Hofkriegsrat. In 1790, Grand Duke Leopold succeeded his brother, Joseph II, as Leopold II, Holy Roman Emperor and King of Hungary and Bohemia. Hungary had been ruled by governors since 1765, but the Emperor-King wished to reinstate the office of palatine, the Diet elected Archduke Alexander Leopold, who thus became the first member of the House of Habsburg-Lorraine to occupy the post. In 1792, his father died, from on, Alexander Leopold served his brother who had succeeded as Holy Roman Emperor Francis II. As palatine, Archduke Alexander Leopold initially led a moderate government, however, he changed his policy after the Jacobin conspiracy in 1794, which left him deeply disappointed. The object of the plot was to make Hungary independent from the Habsburg Monarchy and he severely punished the rebels and replaced the moderate dignitaries, adopting a policy of repression. Archduke Alexander Leopold, suffering poor health, left Hungary for Vienna in 1795. His memorandum, written during his stay in Vienna, shows a rather conservative worldview and he argued that differences between classes should not be overcome, especially when it comes to education. 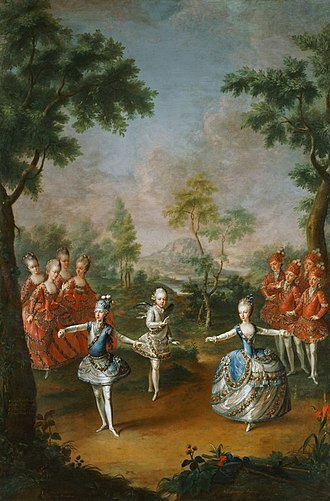 He decided to manufacture and light the fireworks himself in the casemates of the palace, empress Maria Theresa was on her way to spend summer at the palace and when her arrival was announced by a gunshot, Alexander Leopold lit the first rocket. At that moment, the opened and a draught of air threw the rocket back on the gunpowder. The gunpowder exploded and, unable to escape, Alexander Leopold was burned all over his body and he died immediately, as did his servants. His body is buried in the Imperial Crypt in Vienna and his heart was buried separately in Herzgruft, Augustinian Church, Vienna. The Holy Crown of Hungary was the coronation crown used by the Kingdom of Hungary for most of its existence, kings have been crowned with it since the twelfth century. The Crown was bound to the Lands of the Hungarian Crown, no king of Hungary was regarded as having been truly legitimate without being crowned with it. In the history of Hungary, more than fifty kings were crowned with it, up to the last, Charles IV, the enamels on the crown are mainly or entirely Byzantine work, presumed to have been made in Constantinople in the 1070s. The crown was presented by the Byzantine Emperor Michael VII Doukas to King Géza I of Hungary and it is one of the two known Byzantine crowns to survive, the other being the slightly earlier Monomachus Crown, which is in Budapest, in the Hungarian National Museum. However, the Monomachus Crown may have had another function, and the Holy Crown has probably been remodelled, the date assigned to the present configuration of the Holy Crown varies, but is most commonly put around the late 12th century. The Hungarian coronation insignia consists of the Holy Crown, the sceptre, the orb, the orb has the coat-of-arms of Charles I of Hungary. In popular tradition the Holy Crown was thought to be older, dating to the time of the first King Stephen I of Hungary and it was first called the Holy Crown in 1256. During the 14th century, royal power came to be represented not simply by a crown, but by just one specific object and he depicts that the Holy Crown is the same for the Hungarians as the Lost Ark is for the Jewish. Since 2000, the Holy Crown has been on display in the central Domed Hall of the Hungarian Parliament Building, the Crown’s shape is elliptic and is larger than a human head. During coronations, the king had to wear a leather liner, made to fit. The weight of the Crown is 2056 g, the gold-silver alloys in the upper and the lower parts of the Crown differ in alloy ratio. The lower part of the Crown is asymmetric, as is the case with all European Christian crowns, it symbolizes a halo and thus signifies that the wearer rules by Divine Right. Gregory VII, born Hildebrand of Sovana, was Pope from 22 April 1073 to his death in 1085. He was at the forefront of developments in the relationship between the emperor and the papacy during the years before he became pope. He was the first pope in centuries to rigorously enforce the Western Churchs ancient policy of celibacy for the clergy. 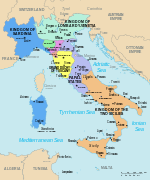 He excommunicated Henry IV three times, Henry IV would appoint Antipope Clement III to oppose him in the political power struggles between the Catholic Church and his empire. Hailed as one of the greatest of the Roman pontiffs after his reforms proved successful, Gregory VII was, during his own reign and this was eagerly repeated by opponents of the Catholic Church, such as the English Protestant John Foxe. Joseph McCabe describes Gregory as a rough and violent peasant, enlisting his brute strength in the service of the ideal which he embraced. His zeal, moral force, and religious conviction, ensured that he should retain to a degree the loyalty. Gregory was born as Ildebrando di Soana in Sovana, in the county of Grosseto, now southern Tuscany and he was said to be of humble origins. One finds in Johann Georg Estor the claim that he was the son of a blacksmith. As a youth he was sent to study in Rome at the monastery of St. Mary on the Aventine, among his masters were the erudite Lawrence, archbishop of Amalfi, and Johannes Gratianus, the future Pope Gregory VI. 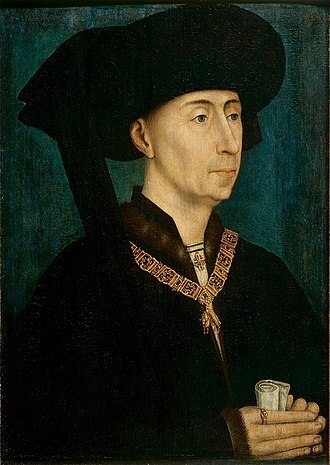 When the latter was deposed by Holy Roman Emperor Henry III and exiled to Germany, according to some chroniclers, Hildebrand moved to Cluny after Gregorys death, which occurred in 1048, his declaration to have become a monk at Cluny must not be taken literally. He accompanied Abbot Bruno of Toul to Rome, Bruno was elected Pope, choosing the name Leo IX, Leo sent Hildebrand as his legate to Tours in France in the wake of the controversy created by Berengar of Tours. At Leos death, the new Pope, Victor II, confirmed him as legate, while Victors successor Stephen IX sent him and Anselm of Lucca to Germany to obtain recognition from the Empress Agnes de Poitou. With the help of 300 Norman knights sent by Richard of Aversa, between 1058 and 1059, he was created archdeacon of the Roman church, becoming the most important figure in the papal administration.